Testosterone therapy can have many benefits including increased libido, mood and energy. However it is not a magic bullet for general use – only those who have the symptoms of low testosterone levels, backed by blood tests to confirm this, should consider the treatment. Make an appointment today to check your testosterone levels, and to discuss your options with our highly experienced urologists. You do not have to have all these symptoms to be suffering from low testosterone. Warning: While testosterone can be hugely beneficial when used appropriately, do not take it without proper medical supervision. It is not safe for everyone, so we do blood tests before treatment to confirm there is no contraindication, and monitor our patients carefully during the period of treatment. Testosterone-replacement therapy is available in several forms. Some experts believe that oral testosterone can have negative effects on the liver. Using other methods, such as skin patches, gels or injections, bypasses the liver and gets testosterone into the blood directly. Gels: A clear testosterone gel is applied once a day and is absorbed directly through the skin. This is one of the easiest and most reliable treatments. Injections and implants: Testosterone can be injected directly into the muscles, or implanted as pellets in the soft tissues. The testosterone is then slowly absorbed into the bloodstream. 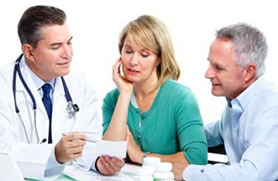 Other medication: If the levels of testosterone are not so low as to warrant replacement, or if it is found that testosterone replacement would not be safe for you, we might prescribe an oral medication that can boost your natural testosterone, which could also boost your fertility.